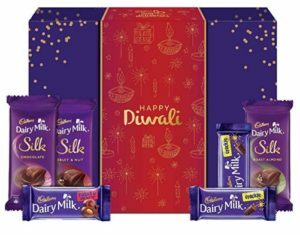 Discover the special gift of Cadbury Chocolate Gift Pack.A perfect gift for occasions like anniversary, birthday to celebrate with delectable variants of chocolates packed together to shower joy.Buy Cadbury Diwali Digitally Powered Assorted Chocolate Gift Pack, 278g worth Rs.615 at Rs.199 only on Amazon. Festivals make you miss your friends and family the most, let’s cherish their presence with cadbury digitally powered gift box. Refer to the image 4th for 3 easy steps to upload a personalised video message and send it to your loved ones.